FLORENCE, KENTUCKY–Today it was William Harrison’s turn to collect specimens for his Independent Study project. He’ll be working a full year on what he’s putting in these bags before he turns in his thesis. 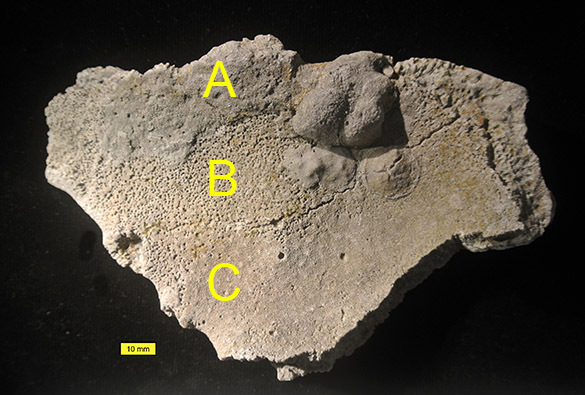 William’s project is an interpretation of the processes that led to bioclaustration pits in Upper Ordovician bryozoans, along with larger questions of bioerosion of trepostome bryozoans. We found some gorgeous specimens at the outcrop above. William is collecting from what used to be called the Bellevue Limestone, a Maysvillian unit between the Fairmount and Corryville Formations. Now it is best known as the lower part of the Grant Lake Formation. 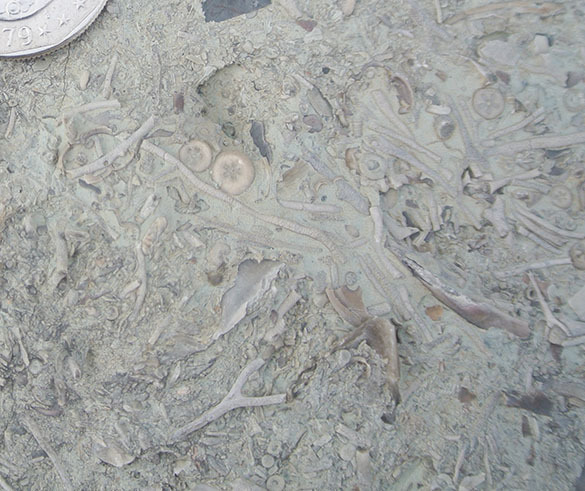 The rocks represent shallow water deposits, much like the Whitewater Formation Coleman was working in yesterday, so it is loaded with eroded and encrusted brachiopods and bryozoans. 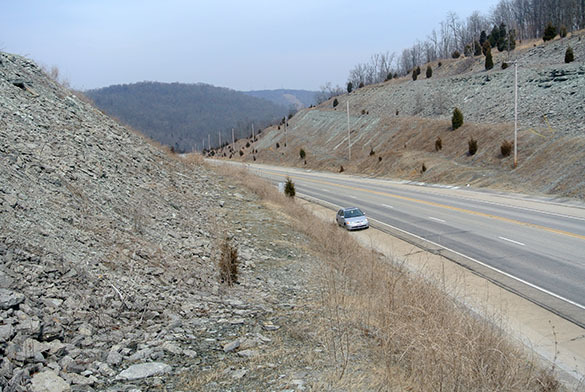 This is Locality C/W-152 in our system along the Idlewild Bypass (KY-8) in Boone County, Kentucky (N 39.081120°, W 84.792434°). 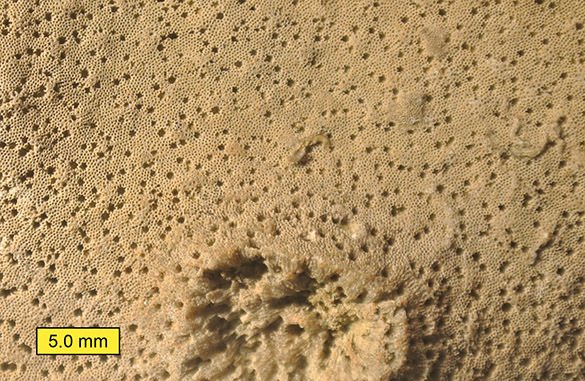 William was particularly adept at finding large bryozoan zoaria (colonies), most of which were riddled with borings. He is here holding a specimen that in life would have been erect on the sea floor like a fan with feeding zooids on each side. 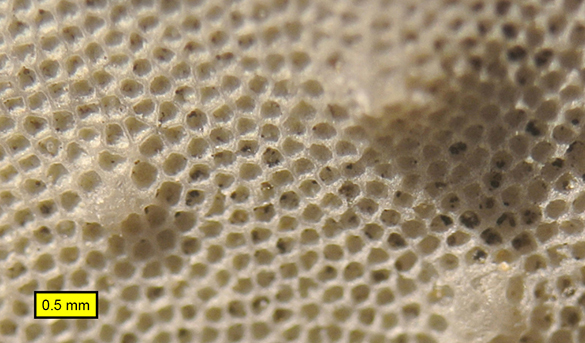 You may be able to make out the many little bumps or monticules on its surface. Guess who our neighbor was during our exploration of this outcrop? Yes, the irony is deep. “Billions of dead things” indeed, Mr. Ham! 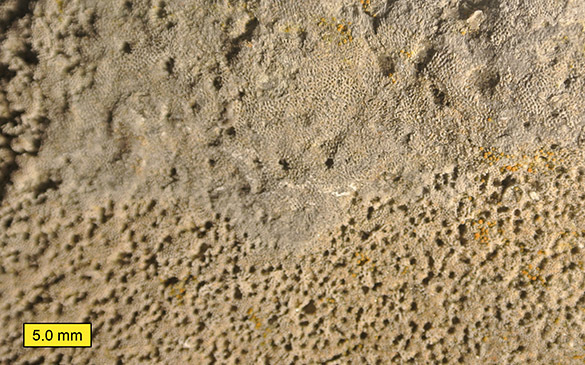 Later that day we collected a few bored and bioclaustrating bryozoans from an exposure of the Kope Formation at Orphanage Road to the east (N 39.02984°, W 84.54121°). We have plenty of specimens to keep both William and Coleman busy, and already some ideas for poster presentations. Just to show the human effect of sampling and collecting, our first stop of the day was entirely unsuccessful. We visited one of my first localities, an exposure of the Kope Formation at the confluence of the Ohio River and Gunpowder Creek in Boone County, Kentucky (C/W-7; N 38.90428°, W 84.79779°). It was here in 1984 that my wife Gloria and I found hundreds of fantastic encrusted cobbles, many with gorgeous edrioasteroids and thick accumulations of bryozoans. These were for a very brief moment famous in the local collecting community. Within a few months they were all gone. William and I were there now 30 years later hoping a new cobble or two might have eroded out, but we found nothing. A future researcher would have no idea such cobbles were present, except for the one paper in the literature. 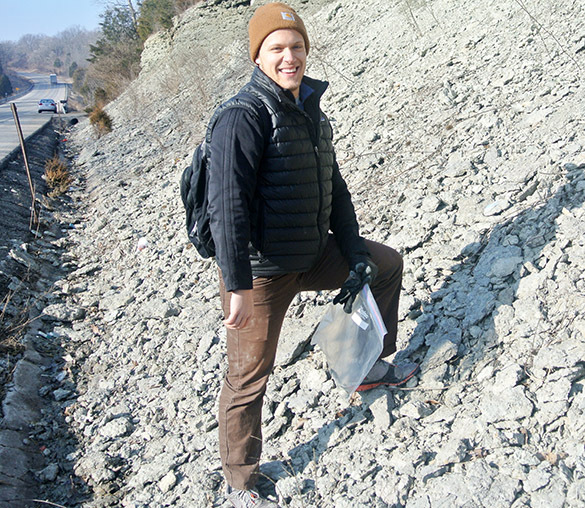 RICHMOND, INDIANA–Meet Coleman Fitch (’15) standing on the iconic outcrop of the Whitewater Formation (Upper Ordovician) on Route 27 about a mile south of Richmond (C/W-148; N 39.78722°, W 84.90166° — which has a nice Google Maps street view). This was his first day of fieldwork for his study of the complex relationship between borings and encrusters on brachiopods and mollusks. Note that Coleman has manfully taken off one glove for fossil collection. Despite the sun, we were freezing for science. Later in the day we collected from a warmer exposure of the Liberty Formation (Locality C/W-149) on IN-101 (N 39.48134°, W84.94843°). Our collecting was very successful today. 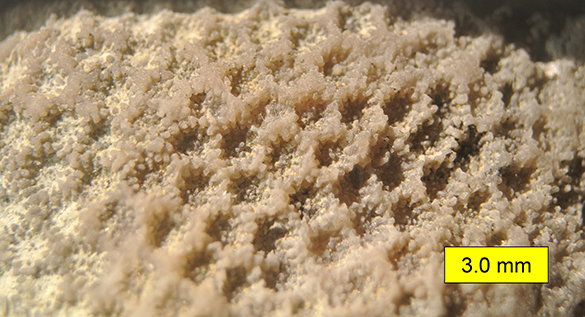 We found numerous examples of “half-borings” on trepostome bryozoan attachment surfaces, and many other curious fossils showing an interplay of early diagenesis (especially aragonite dissolution and calcite precipitation) and biotic processes. 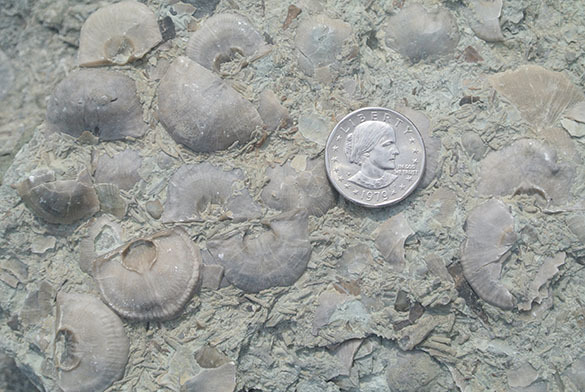 Above is an example of the fun and complex fossils at the Whitewater locality. 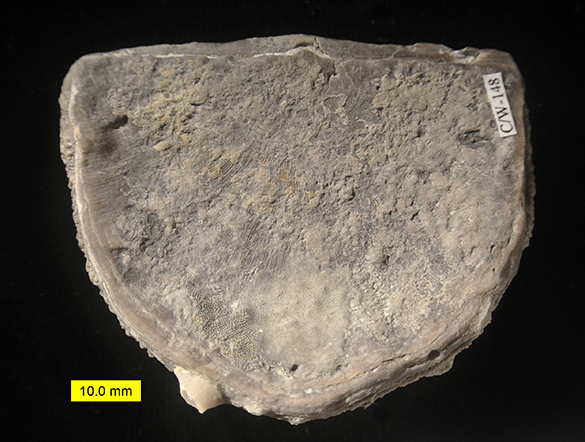 What processes do you think this specimen represents? 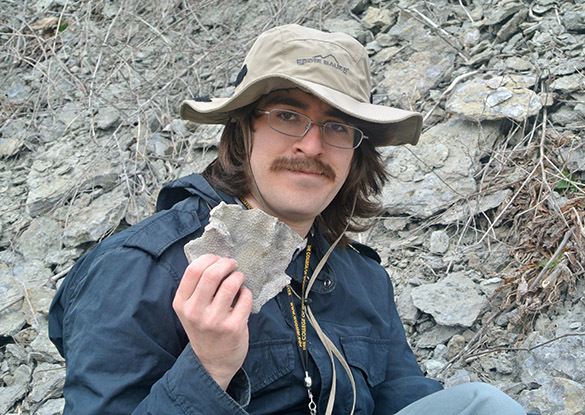 Tomorrow I meet William Harrison (’15) in northern Kentucky to search for bored bryozoans and bioclaustrations. It promises to be much warmer down there! This is another fossil that has sat in a display case for decades in Scovel before I really examined it. Unlike last week’s specimen, though, it has no identifying label on its reverse. This is always a serious disappointment for science — no location! 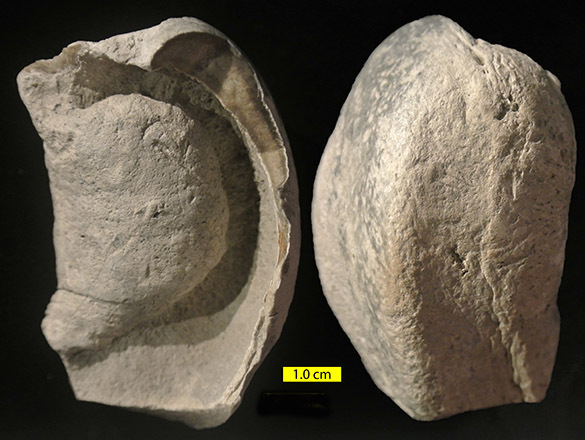 I show the fossil above with a front and back view (as much as there is a front or back). We are looking at an auditory bulla (part of the middle ear system) of an ancient whale. 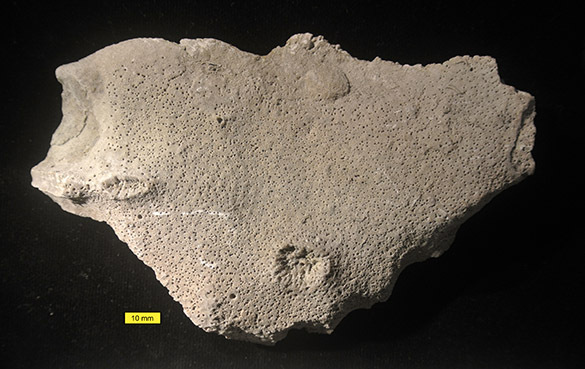 The most we can say is that this may be from a type of sperm whale that lived during the Neogene. Likely this specimen was collected on the east coast of the United States, maybe Maryland or Virginia. 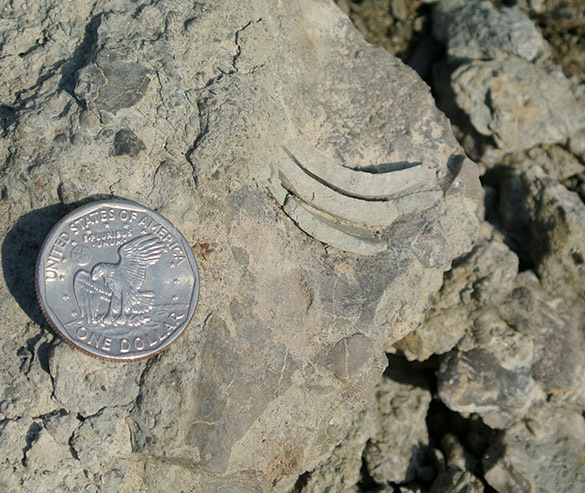 Surprisingly, whale ear bones are rather common in the later fossil record. They seem to have been of denser bone than the rest of the whale skeleton, so they were better preserved. The auditory bulla is a bony cover for the delicate middle ear bones and tissues. In humans it is part of our temporal bone. Whales have several adaptations in their ears for hearing underwater. They have no external ear opening. They use instead the lower jawbone to transmit vibrations to the ear complex (something like what many snakes do). They have a pad of fat to enhance these vibrations for the tiny ear bones (tiny relative to the massive size of the whale). 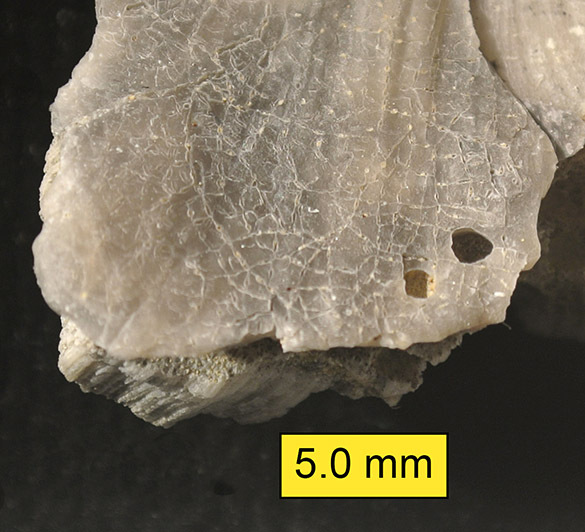 You can learn much more about fossil whale ear bones at this excellent blog post from the Virginia Museum of Natural History. You are asking, though, fine enough, but how can I use a fossil whale ear bone? There’s a video to train you! These bones have “ancient, ancient memory” that is “preserved sonically”. Just be sure to hold it in your non-dominant hand and remember that “this is an art”. Do it correctly and you will have tapped into the wisdom of our ancient whale brothers and sisters. To think that every day I walked blithely by this portal to the Knowledge of the Ages. Fraser, F.C. and Purves, P.E. 1960. Hearing in cetaceans: evolution of the accessory air sacs and the structure and function of the outer and middle ear in recent cetaceans. Bulletin of the British Museum (Natural History) 7: 1-140. Ketten, D.R. 1997. Structure and function in whale ears. Bioacoustics 8: 103-135. RICHMOND, INDIANA–This is the first day of what upper midwesterners hilariously call “spring break”, so it is time to get some students in the field. I can’t say this is the first Wooster geology fieldwork of the year because that crazy Greg Wiles lab was out on the ice in deepest January. I spent today in eastern Indiana exploring field sites for a new generation of Independent Study students. Tomorrow and Monday Coleman Fitch (’15) and William Harrison (’15) will be joining me to collect specimens for their I.S. 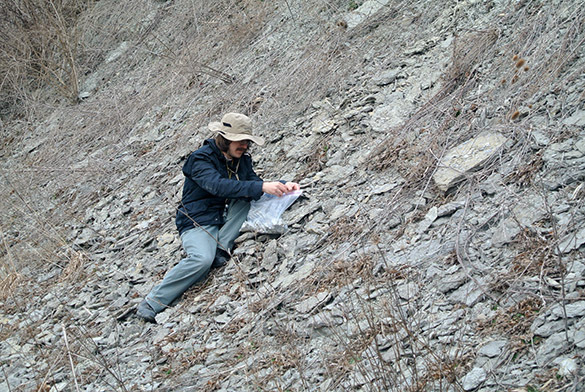 projects on Cincinnatian (Upper Ordovician) fossils. We’ll highlight their work in the next couple of days. I long thought of this beautiful specimen as more rock than fossil. 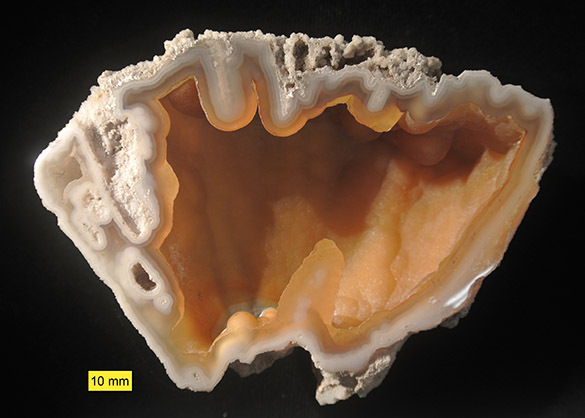 It is a scleractinian coral that has had its outer skeleton replaced by the silicate material agate and its interior skeleton completely hollowed out. The result is a geode that happens to also be a fossil. Then during last month’s North American Paleontological Convention in Gainesville, Florida, I saw the above specimens on display in the Florida Museum of Natural History. These fossils were so striking that I decided to highlight our single example. 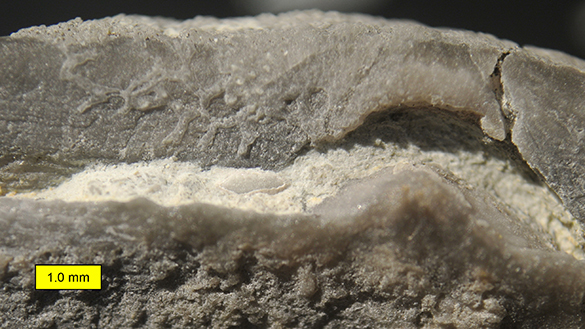 This is a view of the top surface of the Wooster specimen. In the upper left is an array of holes with crystals radiating away from them. 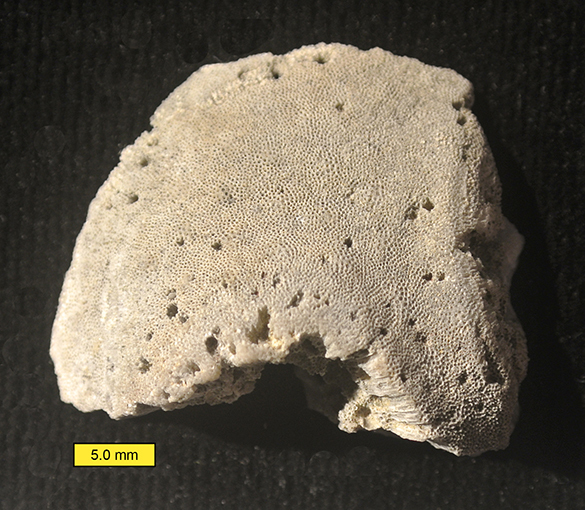 These are remnants of the original corallites, and there is just enough information there for us to conclude the likely genus is Montastraea. This piece thus becomes an example of Florida’s official state stone. 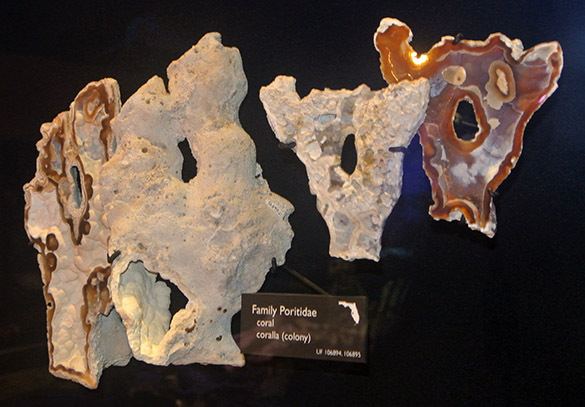 Here’s the official definition: “… a chalcedony pseudomorph after coral, appearing as limestone geodes lined with botryoidal agate or quartz crystals and drusy quartz fingers, indigenous to Florida.” Our specimen came from the Hawthorn Group of rocks near Tampa, Florida. 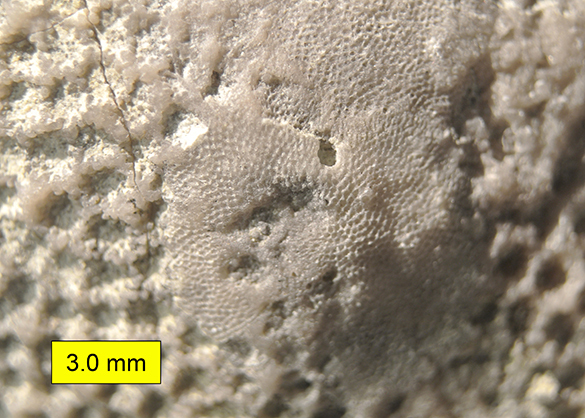 The outside of the fossil shows horizontal banding remaining from the original growth lines in the coral, which is another clue that this is Montastraea. 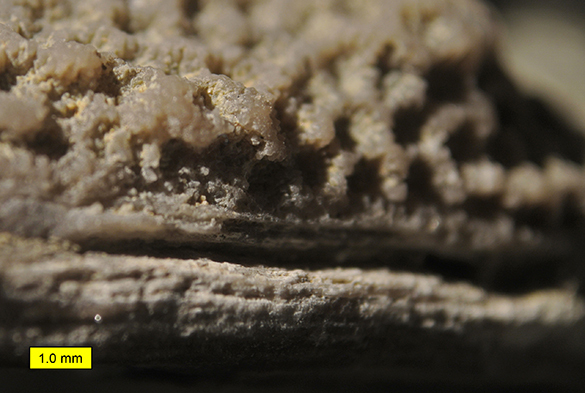 The coral made its skeleton of aragonite around 30 million years ago. 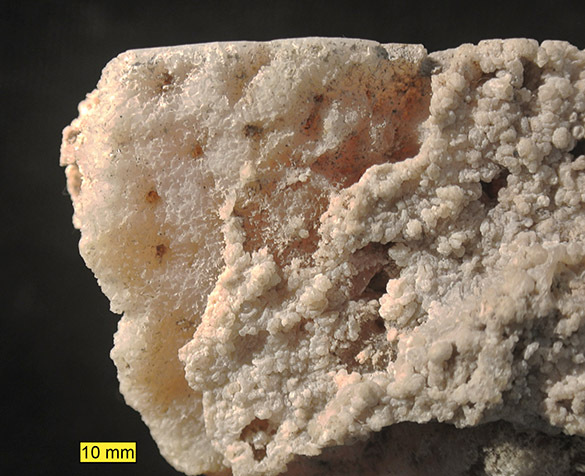 After death and burial, silica-rich groundwater began to replace the aragonite on the surface of the coral with what later became banded agate. The interior dissolved away into a hollow cavity. 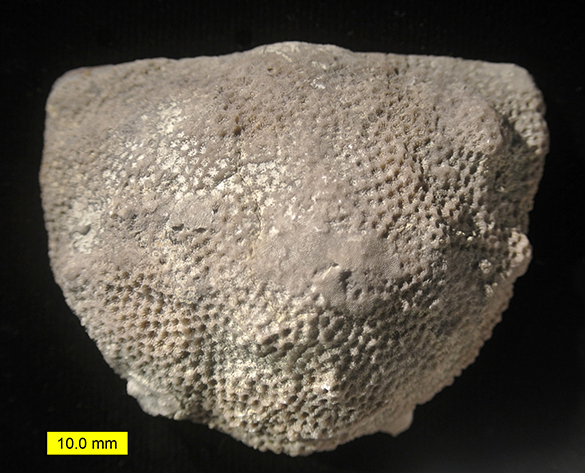 The common name for this fossil is “agatized coral“, and it is a collector’s item. It is apparently Florida’s only native gemstone. Pretty cool that their state rock and gemstone is a fossil! Scott, T.M. 1990. 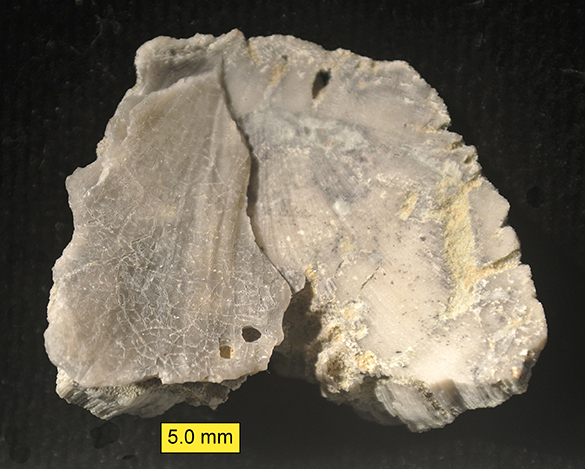 The lithostratigraphy of the Hawthorn Group of peninsular Florida. 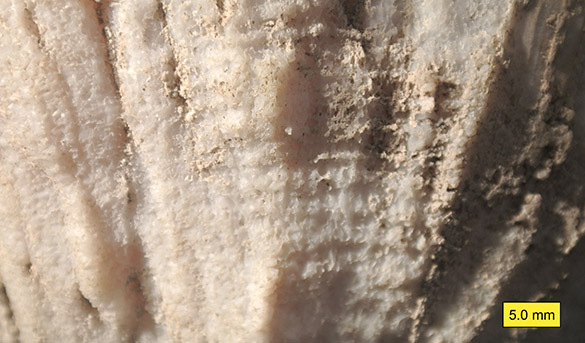 World Phosphate Deposits 3: 325-336.